We import more Pinot Grigio into this country than any other varietal wine, almost a quarter of the total, with some 90% of it coming from Italy. Despite our obvious, collective thirst for the grape, however, it has a bad (and often deserved) rap: a thin, easy, vaguely citrusy, swimming pool-sort-of-wine. Banal. Bland. Brainless. Savaged by critics. Etc. ﻿But the pink-skinned Pinot Grigio, a.k.a. 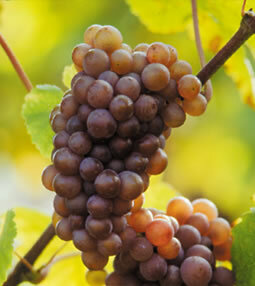 Pinot Gris, Rulaender and Grauburgunder (among others), and a likely mutation of Pinot Noir, is capable of spicy substance and excellence in the right hands and locations, most notably in places like Alsace, Oregon, New Zealand and, yes, Italy, particularly from its northernmost region, the Alto-Adige. At a recent wine tasting I helped organize (re: wine selections) and conducted for alumni of my alma mater, Rhodes College, at NY Vintners, a quality retail wine store/tasting event venue on Warren St. downtown (near City Hall), I wanted to showcase, among the other five wines we sampled, a compelling, perception-altering example of Italian Pinot Grigio. NY Vintners happened to have one available: the Hofstaetter 2009 Pinot Grigio, Alto-Adige. A star-bright pale-straw color, the Hofstaetter had a fresh nose of orchard fruit, citrus and apple pie, with pretty gala apple and pear on the palate, zesty acidity and a long, whistle-clean finish. Elegant, with pretty fruit and persistent energy, it’s a superb illustration of what this oft-disparaged variety can achieve in the high valleys of the Southern Alps. A consensus favorite, the Hofstaetter duly impressed the Rhodes crowd, changing some negative preconceptions about the grape. Highly recommendable, it’s available at NY Vintners for $19.99. This entry was posted in New York City, Wine and tagged Hofstaetter, NY Vintners, Pinot Grigio, Rhodes College. Bookmark the permalink.